Add the oil to a large skillet and sauté the onion over medium heat. Don't let it burn. Add the remaining ingredients. Season with salt and pepper to taste. Reduce the heat to low and cook until it thickens, about 40 minutes. Keep the sauce hot until ready to serve. Season the chillo fillets with salt, pepper, oregano and garlic; add the lemon juice and let them marinate for at least half an hour before frying. Add the olive oil to a skillet over medium-high heat. Place the fish fillets and cook until they’re golden brown on both sides. Pour the sauce over the fish and serve. Serve with white rice, mofongo (mashed plantains) or tostones (flattened fried plantains). If you rather a thicker sauce, add 1 teaspoon of cornstarch when you're almost done cooking, once you have fried your fish fillets. 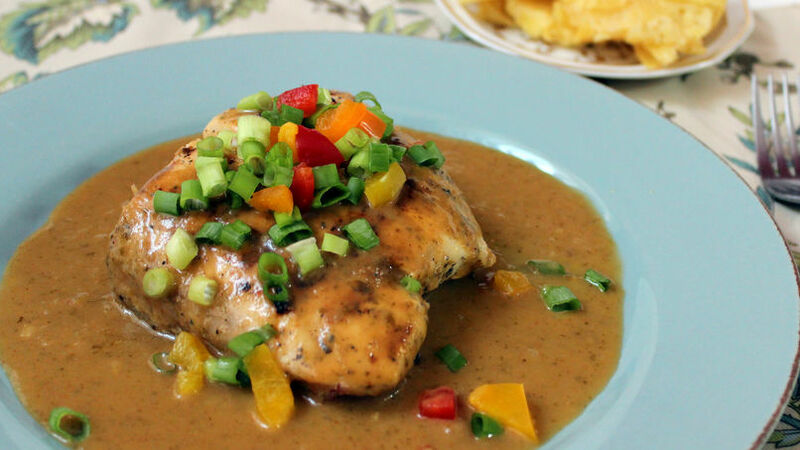 You may use this sauce for any type of fish or boneless, skinless chicken breast. You may add more hot sauce, if you wish. I used one with habanero chilies, but you may use 1 chopped jalapeño and any other hot pepper you choose. Those of us who are from the Caribbean are proud of our fusion of flavors and of our African, Taíno and Spanish heritage. This is reflected in our cuisine, which combines colors, ingredients and spices, and is still known for its simplicity. Sweet, sour and spicy flavors are mixed together to give our everyday foods a different taste, and turn them into colorful dishes that are filled with exotic flavor. These are fit for a king but, in the Caribbean, any family can enjoy them at home, since everyone has access to sea products (fish and seafood). In every family, there's always someone who loves fishing and presents us with fish freshly pulled out of the sea.